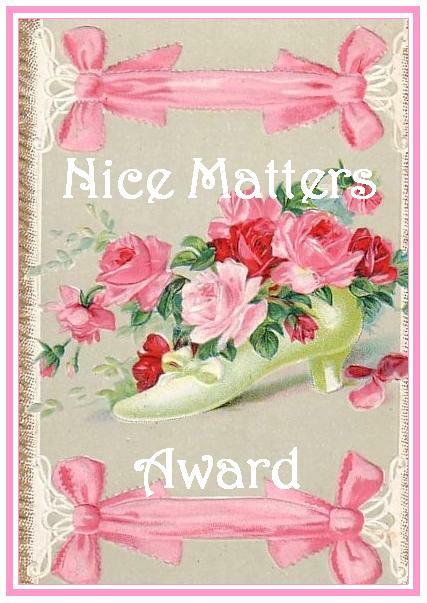 Johnnie at Morsels from God has so graciously awarded me the “Nice Matters Award”!This award is given to those that are just nice people, good blog friends and those that inspire good feelings and inspiration! …Those that care about others, are there to lend support or those that are just a positive influence in our blogging world! and to “Re-Award” Johnnie, I send it back to her! Johnnie, you are always nice, and regularly use the simple Word of God to uplift and encourage your readers! Thanks for spreading godly love through the Blogdom! Now, for the rest of you “Nice” recipients…your job is to name 7 other bloggers!